You may think that it’s tricky to fit an internal folding sliding doorset, but there are a few top tips that can save you time and help avoid costly mistakes. Chris Miller, Doors Product Manager at Jeld-Wen tells us more. Q. How can I save time? 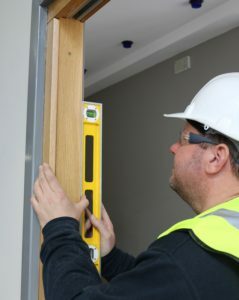 Room dividers can be heavy to lift, particularly if the doors are oak, so it’s best that two of you tackle this installation to ensure safe lifting. Like any job, it’s important to check that you have all the right components and tools to hand so you don’t waste any time. Q. What do I need to think about before I start the installation? First of all, check you have the correct structural opening size for the configuration you are fitting. Decide if the doors will hang to the left or right hand side to ensure you have space for them to fold into the room, remembering that each door is typically 610mm or 686mm wide depending on the overall size of the doorset. Some room dividers might be different, but remember that JELD-WEN’s Room Fold system is designed so they don’t need a bottom track. This means you won’t have to worry about interrupting any flooring that’s already been put down. Q. How can I avoid having to make changes to the frame? My top tip is to take your time when it comes to assembling the frame. If you do everything right, the frame should just slot into the opening and be square and plumb. If the frame does end up being too big, then always adjust the opening and not the frame. Otherwise you’ll just cause problems with the doors further down the line. 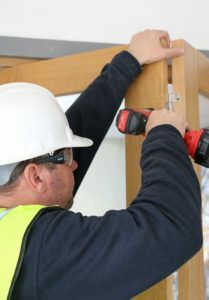 The fixings you use are important as well; make sure you only use those that suit the wall material you’re fixing into. Q. What can I do to make sure the track is fitted correctly? The top track should sit flush with the front of the frame and be secured through pre-drilled holes, ensuring an evenly carried load. Once in place, don’t forget to thoroughly clean the inside of the track, removing any dust and debris to ensure the door carriers run smoothly in the track. The ironmongery supplied with a Jeld-Wen Room Fold doorset is reversible and needs to be inserted into the track in a certain order. Just follow the guide inside the fitting instructions if in doubt! 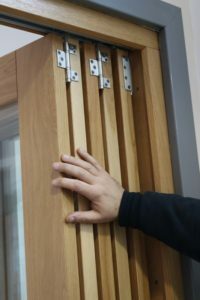 Again, take your time when it comes to positioning the hinges on each door – most of the difficult installations I see are due to easily avoided problems like the hinges being fitted the wrong way round. Offer the door and hinge up in situ so you can visually see if it will work and bend them the correct way to match the fitting instructions. Fit the doors in order of sequence and make sure you use the correct ironmongery. 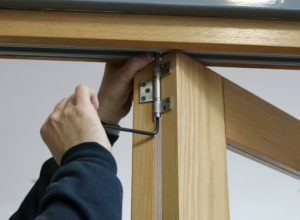 Once the doors are in place, close any gaps between them using an Allen key to adjust the carrier or pivot ironmongery. You can make height adjustments up to 15mm depending on your floor covering.